The Commercial Space Blog: Funding the "Son of Sapphire!" The multi-year maze of financial hoops and hurdles facing any proposed Canadian government military space project is back in the news with recent reports that the Department of National Defence (DND) is looking to build a follow-on to the successful Surveillance of Space (Sapphire) satellite. The Sapphire ground system architecture. The ground segment is composed of a Spacecraft Control Center (SCC), a Satellite Processing and Scheduling Facility (SPSF) located in Richmond BC. S-band command telemetry and data is sent to Sapphire from ground stations in Abbotsford BC and Guildford, UK. Data is also shared with the Space Surveillance Operations Center (SSOC) in North Bay, which shares data with the US Space Surveillance Network. Graphic c/o MDA. 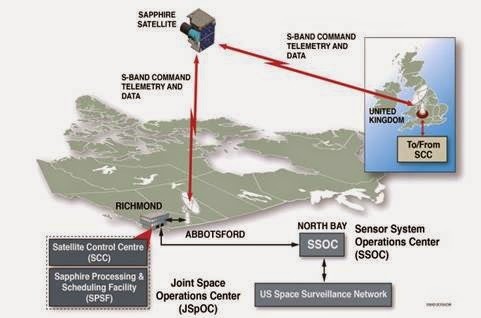 Sapphire, Canada's first military satellite, was constructed by Richmond based MacDonald Dettwiler (MDA) using an SSTL-150 bus produced by UK based Surrey Satellite Technology (SSTL) and an optical payload built by Cambridge based COM DEV International. Launched in 2012, it was designed to monitor space debris and satellites within a medium Earth orbit (between low Earth and geostationary orbit) and is expected to function as a component of the US Space Surveillance Network (SSN) until at least 2017. The new program (known officially as Surveillance of Space 2 and unofficially as the "Son of Sapphire") was originally part of the $100Bln CDN "wish list" of potential government military expenditures released on June 16th, 2014 as part of the Canadian government Defence Acquisition Guide (DAG), but didn't initially seem any closer along the path to procurement than any of the other listed programs. According to the article, a follow-on program would would go a long way towards maintaining access to the US data provided by the SSN (which is operated through NORAD), after the current SSN agreement expires in 2017. Current ground assets of the US Space Surveillance Network, which detects, tracks, catalogues and identifies artificial objects orbiting Earth, such as active/inactive satellites, spent rocket bodies, or fragmentation debris. Graphic c/o Wikipedia. It's also the logical follow-on to a program which was itself designed to replace the original Canadian contribution to the SSN, a series of three ground-based telescopes in Canada functioning as space surveillance sensors, which were decommissioned in 1992. It's unlikely that the US will wait as long as it did the last time for Canada's next contribution to a program generally conceded to be a "joint operation," so its likely that the "Son of Sapphire" will be fast-tracked for future funding. Although the first Sapphire was listed as costing approximately $96.4Mln CDN including design, development, building, ground infrastructure and personnel according to the January 30th, 2014 DND website update "Space Situational Awareness and the Sapphire Satellite (BG 14.002)," the follow-on project was estimated in the current DAG to cost somewhere between $100Mln and $249Mln CDN. Expect the final numbers to be on the high side of that estimate. After all, the first step in the modern government procurement process is normally to low-ball preliminary cost estimates in a bid to gain political support.